This diagram is a more refined graphical representation of the progression of the 90 quadrations as they occur over time. The layout is specific in that it groups the rising spread with the moon spread, along with their binary state partners. Look at the bottom center Oracle labeled 'The Fool'. The 0 and 88 blocks are colored blue to represent their relationship of Rising (0) and Moon (88). Their binary state counterparts are Rising (45) and Moon (43). Since the 0 and 45 progressions are the same (except for the binary state cards), it would not be necessary to expose the quadrations 45 - 88. However, by exposing all 90 quadrations this diagram paints a vivid picture of how they operate together to generate the 22 Oracles. 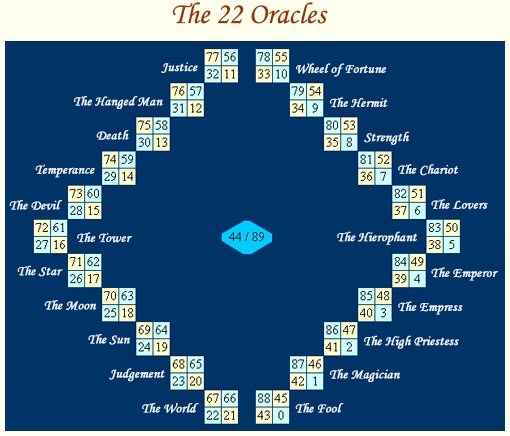 If you follow the bottom-right square in each 4x4 Oracle, you will traverse the 22 Oracles in order, as representative of the Major Arcana of the Tarot. When you get to the 11th Oracle, the colors reverse to note that the Fool is now embarking on a higher octave of manifestation. When you reach The World, you have completed the journey, the final state of cosmic consciousness. An interesting event occurs when you reach the age 22. You remain in The World Oracle, but the rising spread is now on the left and the moon spread is now on the right. Now you follow the bottom-left square, and traverse the Oracles in the reverse order. The statement being made here is that after 22 years, you have come into contact with all of the possible quadration configurations, with a twist. The binary state cards will later switch places, and the rising spread and moon spread are reversed for the remaining 22 Oracles. On the journey back through the Oracles, from years 22 - 43, the readings will always be done with the rising spread on the left, and the moon spread on the right. And the direction of travel is in reverse order as compared to the first 22 Oracles. Since the year 22 is the turning point where this occurs, it greatly highlights this Oracle (The World). At age 21 you first experience The World, and then at age 22 you remain in The World, but your moon spread and rising spread switch places. This is best described by the concept of 'deja vu'. The Rising is experiencing the Moon in a way akin to where it was coming from. The outward seeking (Rising) energy will be set in the roots (Moon) of its own experience. This can be a time of great revelation, and of deep reflection. If the individual had not been able to contact the deep-seated (Moon) drives buried in the life experience, they will not be able to avoid it at age 22. Still, The World is a place of great satisfaction, and we should all take advantage of that position. If there is learning to be accomplished, there is no need to pine away at what could have been. Make use of this time of great energy (Oracles 21 and 22) to align the course of life in a way that maximizes the highest potential. The journey continues in reverse from Oracles 22 - 43. During this time we may have the urge to feel failure at those times where we now experience the Moon drives from the position of the Rising energy. When we see that we have not accomplished those things which have been driving us, there is no escaping it. It is right (Rising) in our face. To make matters worse, those difficult years of The Tower, The Devil and Death are looming. It can be overwhelming in a way that a person may want to drop out. Just remember, dropping out can be useful if we take the time to handle what should have happened in the years 21 and 22 (Oracle 21, The World). If we drop out and still do not align ourself with our highest potential, we will continually judge ourselves (Oracle 23, Judgment) and drop back to an adolescent Oracle 22. The phenomenon about judgment is that the subconscious will not allow that part of ourself to proceed (that part being judged). It will be held back as a form of punishment until we get it right. Our body will age with time but our soul will get stuck, spread out from there until the current age. The only resolution to this problem is to learn how to forgive. When we forgive ourselves (for not having done it right) we are offered the grace to try again. Sometimes, to learn to self-forgive we may have to practice by forgiving someone else. The universe has a strange way of teaching us. On our way back through the Oracles, every attempt at learning to forgive strengthens the Sun (Oracle 24/19), and as an attractive mechanism it pulls us through our Judgments (Oracle 23/20) that we may continue our journey in The World (Oracle 22/21). As we align with our Soul purpose, our higher mental faculties awaken to oversee our progress, and in the process we enhance our understanding of the depth and the nature of our struggle. As we continue, at age 43 we reach The Fool again. This marks the time of one traversal of the 22 Oracles (forward-outward and reverse-inward). At age 44 we arrive at the center of the diagram. Now we can integrate all past experiences as the sun spread aligns with its binary state partner. Here, year 44 represents both the rising spread and moon spread, which sit, as always, aside the sun spread. All 3 spreads are the same except that the binary state cards have changed houses. This is the first time that we will experience fully the binary state presence. We first experienced our sun spread (Gestation spread) in the womb, so access to it was only available via prebirth memory. Now at age 44 we experience the binary state partner to our sun spread. At age 45, we begin traversal through the Oracles again. But this time, we will have already experienced each Oracle once, with the difference being the binary state cards will be in their alternate house. Much of the time spent in the years 45 - 88 will relate to how we perceive the fixed and binary state cards in our life. At age 89 we fully experience our sun spread as it becomes the sun, moon and rising experience for that year.